Round trim. 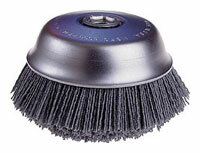 Nylon polishing Cup Brush. Silicon Carbide. 5/8 - 11 NC threaded arbor hole. Maximum RPM 6000. This is the most popular size and grit!